The actual transition may have already been introduced in 1938, based on photos of actual equipment labels etc., that I have captured in my database (see the "Markings on Feld-Hell machines" page). Clearly, as the war progressed, materials and skilled labor became increasing scarce. Hence, the design and manufacturing was rationalized, starting in 1943. In general, none of the changes that are documented here affect form, fit, functionality, or performance of the machine. Note that there are also derivative Feld-Hell models, that are not regular design evolutions of the standard Feld-Hell: model Tbs 24b, built by the Hell company rather than Siemens-Halske, and post-WW2 model HTG-1, built in Hungary. Before the transition ca. 1938, the equipment label only comprised either the equipment designator or the drawing number, the serial number, and the year of manufacturing (see Fig. 1 and 2). After the transition, the label had both the equipment designator and the drawing number, and was expanded with the operating voltage, and the logo or identifier code of the manufacturer. See Fig. 1 and 3. There is a round 12-pin connector ("Zwölffachsteckdose", "Steckerbuchse", "Anschlußbuchse") located at the lower right-hand corner of the Feld-Hell's amplifier box. 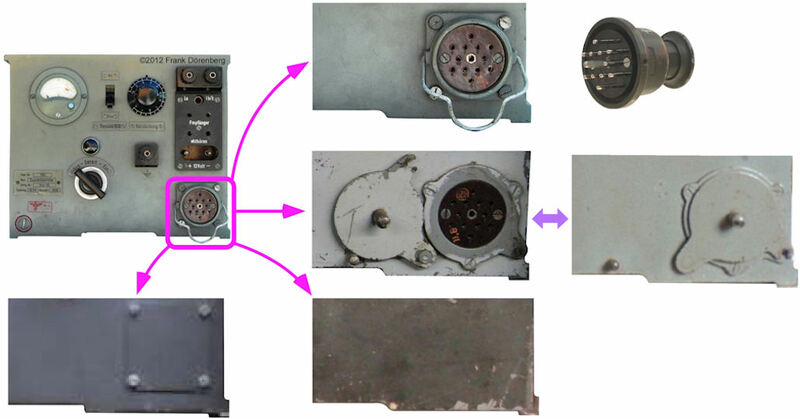 This connector provides access to the contacts of the character-drum, for keying a CW transmitter. There are also outputs for accessories such as a remote control unit and a keying device for high-power CW transmitters: the constant 900 Hz tone, 12 volt DC and 165 volt DC. This connector has a brown, dark brown, or black Bakelite insert. The natural color of the Bakelite resin is brown. Black is obtained with a molding powder, hence more expensive. I have seen at least one Feld-Hell machine where the connector had a white insert. This may have been a very early model, with a ceramic insert (note that the first RV 12 P 4000 vacuum tubes (1935) had a white porcelain base). no round connector, and no hole in the front of the box. It appears that the connector (and associated internal wiring) was eliminated some time during 1944. The majority of field operations was probably over phone lines, in which case the connector is not used. Eliminating the connector saves material and labor. 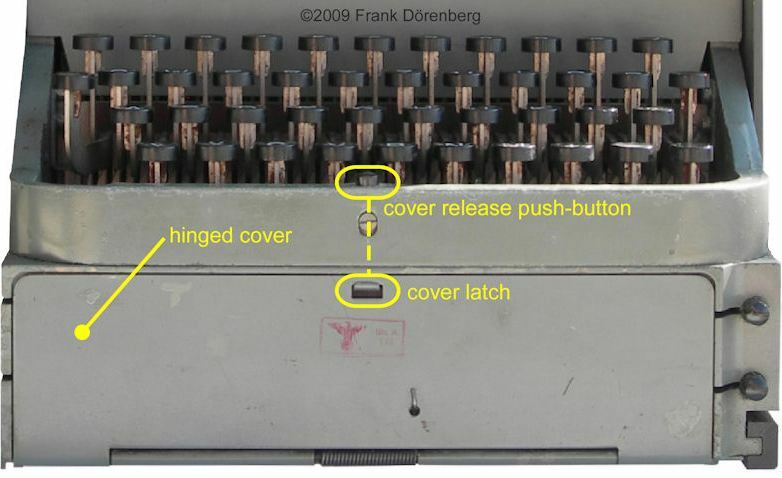 Once the connector was eliminated, is was also no longer necessary to machine a hole for it in the front of the die-cast box, and install a cover plate. Further savings! 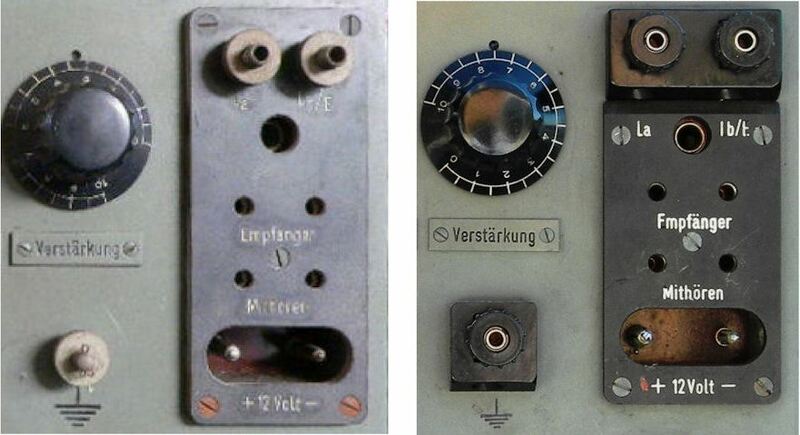 The shape of the knob of the main switch was changed in the course of 1938: from asymmetrical to symmetrical. Possibly the latter is more rugged, as force is not applied off-center. At the same time, the knob material was changed from cast metal to Bakelite - possibly a cost reduction. Note that the actual switch is not a rotary switch at all: its is a simple slide switch that is actuated by an eccentric lever on the shaft of the knob! There is a red indicator lamp, just above the main switch. It is illuminated when the main switch is in the upright "Bereit" position ("Standby"). At best, the lamp is a "nice to have" feature, as it does not illuminate when there is no circuit-continuity through the motor's carbon brushes and commutator. Other than that, it provides no useful information - the voltmeter already indicates the 12 volt power level. A number of units from the final production year (1944) do not have the lamp installed (nor pre-wired) and there is no a hole at its place in the front of the box. Material and labor savings! 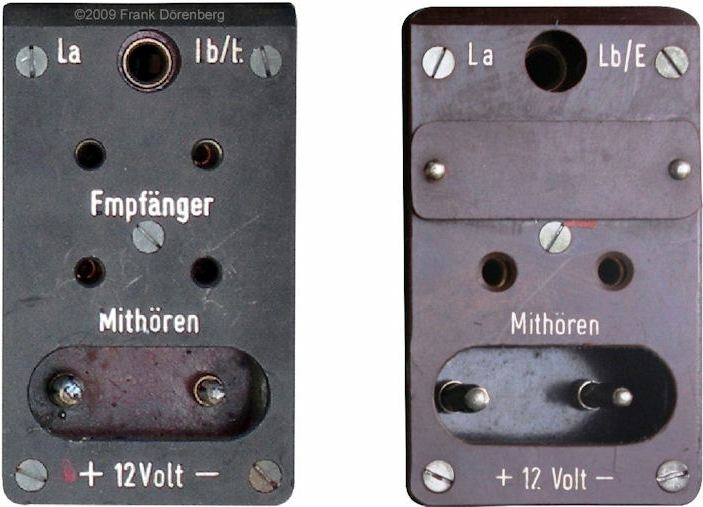 The Feld-Hells have three binding-post terminals ("Polklemme"): one for case-ground (earth), and a dual binding-post for the La - Lb/E phone line wires. In the 1936 model, the binding posts are all-metal. The dual binding-post is on the same rectangular Bakelite block as the phone line jack, the radio and headset jacks, and the 12 volt power connector. The case-ground binding-post can only accommodate a wire, whereas the dual binding-post can also be used with banana plugs. The binding-posts of the 1939/40-1944 models have a Bakelite knob for (un-)tightening. The dual binding-post is mounted on a separate Bakelite block. The terminal for case-ground is also mounted on a Bakelite block, and can also accommodate a banana plug. Also see Figure 1 above. 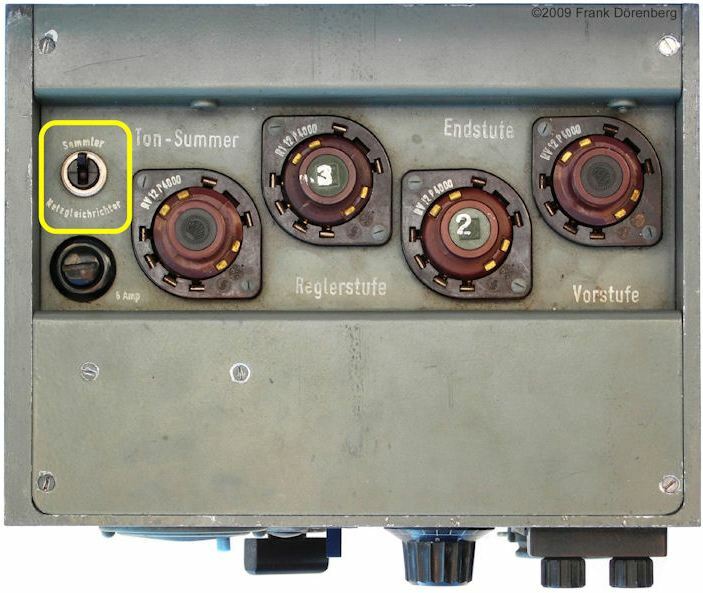 The connector block of the amplifier box has jacks for connecting the loudspeaker/headphones output of a radio receiver ("Empfänger"). Some units that were built during the final production years (1943/44) have a small Bakelite plate that covers these jacks. I do not know whether the jacks (and wiring) are not installed, or only covered up. For operation over phone lines ("Drahtbetrieb"), this interface is not required. The Feld-Hells in which this modification was made, typically also do not have the 12-pin round connector for interfacing to a CW-transmitter. The connector block is made of light brown, dark brown or (more expensive) black Bakelite. In my database, there appears to be no consistent switch-over between colors. Brown and black connector blocks are found in pre-war machines as well as late-war machines. There also appears to be no correlation between the Bakelite color, and the manufacturer of the amplifier box (Siemens-Halske vs. Mende Radio). There is a toggle switch on top of the electronics box. It is labeled "Sammler – Netzgleichrichter". That is: "battery – transformer-rectifier unit". In the "Netzgleichrichter" position, a 5 Ω resistor is placed in series with the 12 volt DC power input when the main switch is in the "Bereit" position. This is to support an older model Feld-Hell-specific external power supply, that had poor voltage regulation under low-load conditions. 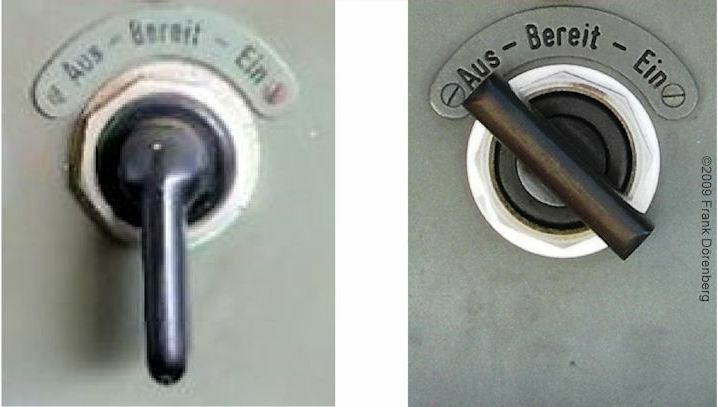 According to the 1941 Feld-Hell manual (line item 44), "newer" Feld-Hell versions do not have this switch. So far, I have found only three amplifier boxes without the toggle switch. Both were all manufactured in 1943. In one case, the switch (and associated wiring) are simply not installed. There are no indications that the switch was removed after installation. In the second case, there are no legends for the switch positions, and the hole has a round cover plate. In the third one, the hole is completely eliminated. a cover plate underneath the drawer compartment. When the upper paper cassette of the Feld-Hell runs out of paper, the lower cassette must be opened, the paper tape pulled through a slit on the left of the cassette, and the paper passed underneath the printer spindle. Exactly the same procedure is followed when simply putting a new roll of paper in the upper cassette. So, in fact, the second (= lower) paper cassette of the Feld-Hell is just a convenient place to store a spare roll of paper tape. Pure luxury! Towards the end of the war, this luxury became unaffordable. Some of the machines built in 1943/44 dispensed with the compartment cover plate, the lower paper tape cassette, the mounting hardware and release button for the lower cassette, and the cover plate underneath the compartment. In a final rationalization step, the release button for the (no longer installed) compartment cover plate was no longer installed. Also, drilling and machining steps for for the paper exit slit and the (no longer installed) cassette release button were skipped. The 1944 machine shown in Fig. 12 shows the final rationalization step: the release button for the (no longer installed) compartment cover plate was no longer installed in the frame of the keyboard. Also, drilling and machining steps for for the paper exit slit and the (no longer installed) cassette release button were skipped. The printer module comprises the printer spindle (helix) and the printer hammer with its electromagnetic actuation. In early Feld-Hell machines, the actuation is done with a single solenoid (coil) that is installed on a rectangular laminated iron core. Starting around 1939/1940, a new printer module was introduced (compare the 1939 and 1940 issues of the same Siemens-Halske brochure, ref. 1 and 2). It is nearly identical to the printer module of the civil Presse-Hell printer model T.empf.14 that was introduced in 1940. The photo series below shows several side-by-side views of the original and the new Feld-Hell printer module. They are electrically and mechanically fully compatible and interchangeable. In the photos above, note that the tabs for the mounting screws are red. This means that it was allowed to loosen the screws as part of field maintenance. Screws without such color coding were only allowed to be touched by qualified teleprinter technicians in a maintenance shop. The right-hand photo in Fig. 15 above shows an electrical contact that is actuated by the printer hammer. It is visible just below the copyright mark. This contact is closed when the solenoids are de-energized. It is wired to the connector "fingers" on the back of the module (also see Fig. 18 below). This contact is not used in the Feld-Hell. However, it is used in the Presse-Hell printer, as part of the circuitry for remote-controlled start/stop via long tone-pulses (ref. 4). In the new module, the spindle is different: it has a larger diameter and the shape of the thread is simpler. This makes it easier to manufacture. Also, the small pinion gear wheel is now fixed with a screw through the spindle shaft, instead of a taper pin. Again, easier to manufacture than drilling a tapered ( = conical) hole through the shaft. In the original design of the printer module, the height-adjustment of the printer hammer is not accessible from the outside. This adjustment is not something a Feld-Hell operator should be plying with... In the new module, the hammer-height adjustment has been simplified and can be done from the outside. It is unclear what the two holes in the bottom of the cover are for - they do not provide access to adjustable or verifiable parts. Note that the adjustment wheel and the associated lock screw do not have a red marking, so adjustment was only allowed by special technicians. The primary difference is the configuration of the two identical solenoids: in the new Feld-Hell module they are connected in series, whereas in the Presse-Hell they are connected in parallel. This has to do with the specified solenoid-current drive: 10 mA in the Feld-Hell and 20 mA in the Presse-Hell (18 mA minimum). So, with a simple change of the solenoid interconnection wiring, the Presse-Hell module is fully compatible and interchangeable with the new Feld-Hell module, and one-way interchangeable with the original Feld-Hell module. 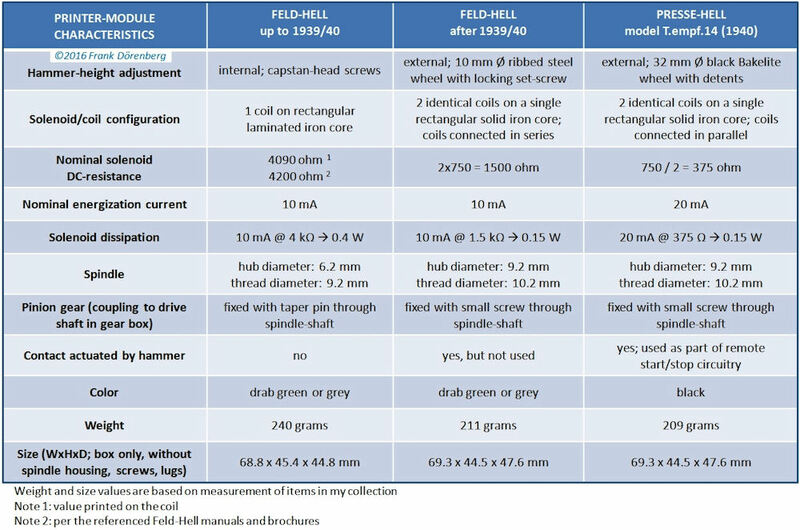 The Feld-Hell solenoid is dimensioned for an energization current of 10 mA, because that is the maximum anode current of the RV12P4000 vacuum tube that turns the solenoid on and off. The Presse-Hell keying amplifiers typically have an output stage with a vacuum tube such as the AL4, EBL1, EL11, or RL12P10. These tubes all have 36 mA drive capability - more than enough for the required 20 mA. What were printer modules with the four-start spindle used for? Clearly, not to print Hellschreiber signals. They were used to record Morse telegraphy signals! For Hell Morse-printers with a different type of spindle, see the "Feld-Morseschreiber built by the Hell Co." page. The next figure also shows Morse signals (here: the word "SIEMENS") printed with a two-start spindle. However, this was not printed with a Feld-Hellschreiber machine, but with a Presse Hell machine. Its spindle turns twice as fast as the Feld-Hell spindle. This has the same effect as using a four-start spindle, as shown in Figure 29 c) above. The speed of the paper tape of a Presse Hell printer is also higher than that of a Feld Hell printer, which accounts for some minor differences between Fig. 30 and Fig. 29 c). 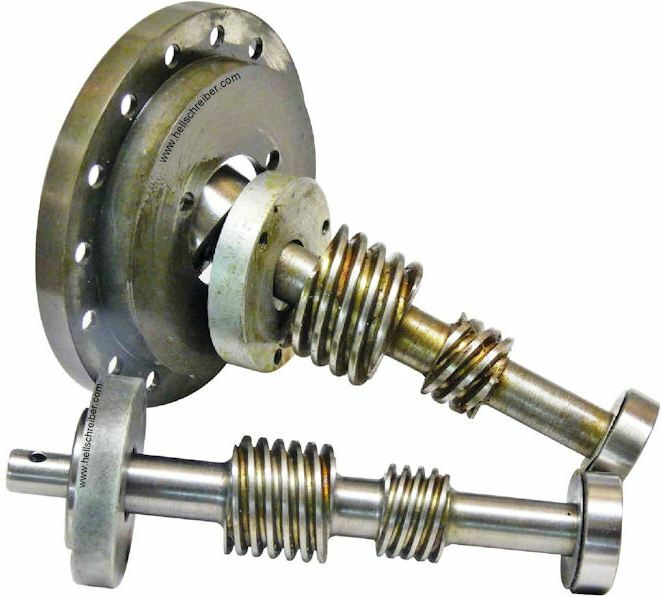 Siemens & Halske did patent a self-adjusting spindle-and-hammer arrangement, with flexible elements (ref. 6). It does not appear to have ever been industrialized. input shaft. It is installed vertically, and coupled to the motor. This shaft has two worms. character-drum drive shaft. It has one worm gear (a.k.a. worm wheel) that meshes with the larger (upper) worm of the input drive shaft. One end of the shaft has a large metal gear, that meshes with a pinion gear on the character drum. A worm at the opposite end of the shaft drives the paper transport shaft. Note that the term "worm gear" is often incorrectly used to denote the combination of a worm and a worm wheel. paper transport drive shaft. It has a worm gear that meshes with the worm at one end of the character-drum drive shaft. printer spindle drive shaft. It has one worm gear that meshes with the smaller (lower) worm of the input drive shaft. The crown gear at the opposite end of the spindle drive shaft meshes with the pinion of the actual printer spindle. All worms are made of steel, and are single-start. All worm gears are made of "Hartgewebe" (HGW): cotton-reinforced phenol-formaldehyde resin. All worm gear wheels are helical gears: the teeth are not parallel to the gear's axis of rotation, but set at an angle. The teeth are actually very slightly curved, and are in fact a small segment of a helix. Helical gears run more smoothly and quieter than simple "straight cut" spur gears. However, they also exhibit more sliding friction between meshing teeth than spur gears - which is why they are lubricated. 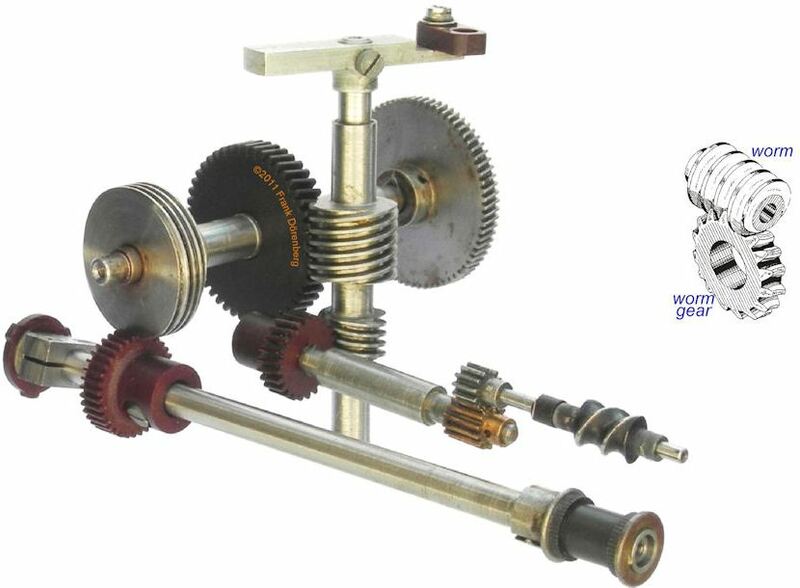 At some point in time, the geometry of the worms and corresponding worm gears were changed. Their pitch (the on-center distance between adjacent teeth of the gears, and the coarseness of the thread of the worms) was increased. 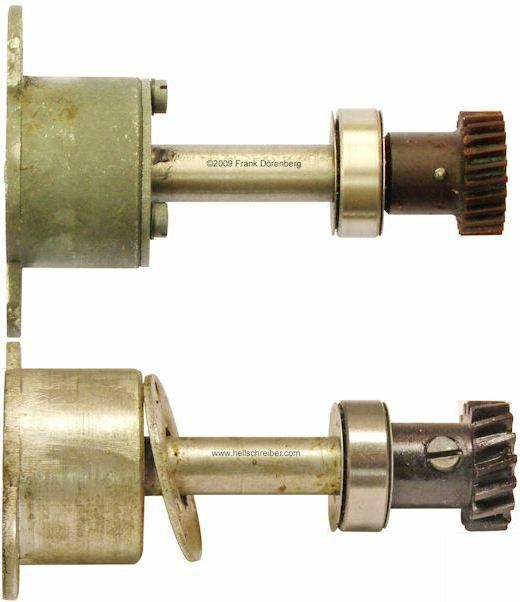 A the same time, the diameter of the worms was increased and that of the worm gears decreased decreased accordingly - the geometry and position of the drive shafts remained unchanged. The gear ratio of a worm gear set is obtained by dividing the number of teeth of the worm gear-wheel, by the number of starts (threads) of the worm. In our case, all worms are 1-start. So the gear ratio is simply the number of teeth of the worm gear-wheel. Depending on the gear wheel, the number of teeth was reduced by 10-30%. I am still trying to figure out the technical reasons for these changes, and why it did not affect the rpm of the printer spindle and the character drum... These gear changes were not made for economic reasons. One more change was made to the worm gears of the drive shaft of the character drum and of the printer spindle. See photos above. 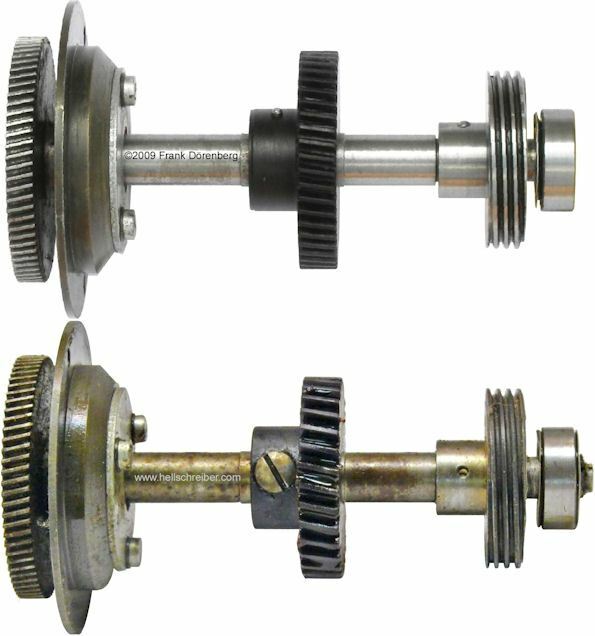 Originally, these gears were affixed to the drive shaft with a tapered pin through the hub of the gear wheel and through the shaft. Making a tapered hole requires a special tool: a tapered reamer. Also, the taper of the hole through the shaft must match the taper through the hub of the gear wheel. This usually means that the worm gear must already be on the shaft when the hole is reamed. All this takes time during production, and a skilled machine operator. Removing the taper pin - without damaging the gear or the shaft - is also not easy. The entire process can be greatly simplified by mounting these gearwheels with a standard, cheap, mass-produced M3 screw. Yes, this is technically somewhat inferior. But now the holes through the shaft and the gearwheel can be made separately (time and location), with a simple drill and a tap, and without specialized labor. Note that the worm gear on the paper transport drive shaft is screw-mounted in all Feld-Hells. This has to do with the fact that the gear is installed after the shaft is installed in the gear box. Ref. 4: "Remote control sequence of the Presse Hell printer", Frank Dörenberg, August 2014, 8 pp. Ref. 5: "Abtast-Telegrafen", chapter IV in "Taschenbuch für Fernmeldetechniker", H. W. Goetsch, Oldenbourg Verlag, 1940, pp. 411-427 of 787. Ref. 6: "Schreibsystem für Bildpunktschreiber" [printer head for dot printer], Paul Storch, Otto Steiner, Fritz Hennig, Siemens & Halske A.G., German Reichspatent Nr. 744828, patent applicable from 4 october 1940.